We left Queenstown to make our way to Milford Sounds. Stopped in Te Anau for morning tea and to buy some lunch for our day trip. We we will be staying at Te Anau for the night. Arrived at Milford Sounds just in time for our boat trip. Day five of our fast trip around the South Island with my friends from the UK. November 5, 2013 New Zealand. Milford Sound (Māori: Piopiotahi) is a fjord in the south west of New Zealand's South Island, within Fiordland National Park, Piopiotahi (Milford Sound) Marine Reserve, and the Te Wahipounamu World Heritage site. It has been judged the world's top travel destination in an international survey (the 2008 Travelers' Choice Destinations Awards by TripAdvisor) and is acclaimed as New Zealand's most famous tourist destination. Rudyard Kipling had previously called it the eighth Wonder of the World. Milford Sound is named after Milford Haven in Wales, while the Cleddau River which flows into the sound is also named for its Welsh namesake. The Māori named the sound Piopiotahi after the thrush-like piopio bird, now extinct. Piopiotahi means "a single piopio", harking back to the legend of Māui trying to win immortality for mankind - when Maui died in the attempt, a piopio was said to have flown here in mourning. Milford Sound sports two permanent waterfalls all year round, Lady Bowen Falls and Stirling Falls. After heavy rain however, many hundreds of temporary waterfalls can be seen running down the steep sided rock faces that line the fiord. They are fed by rain water drenched moss and will last a few days at most once the rain stops. 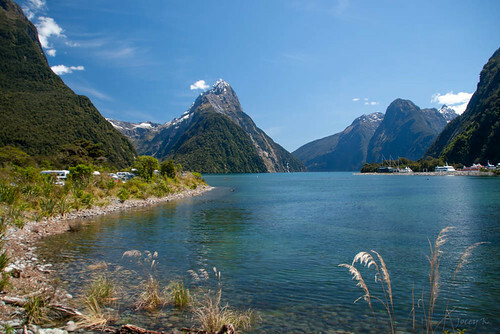 With a mean annual rainfall of 6,813 mm (268 in) on 182 days a year, a high level even for the West Coast, Milford Sound is known as the wettest inhabited place in New Zealand and one of the wettest in the world. Rainfall can reach 250 mm (10 in) during a span of 24 hours. The rainfall creates dozens of temporary waterfalls (as well as a number of major, more permanent ones) cascading down the cliff faces, some reaching a thousand metres in length. Smaller falls from such heights may never reach the bottom of the sound, drifting away in the wind. Any one interested in following our trip around the South Island.. here is a map: <a href="http://www.wises.co.nz/l/lewis+pass/#c/-41.801671/172.516537/8/"